Lenore in the Breaking Dawn Ghost Raven Cemetery Iverson Original Painting on Canvas by Laura Milnor Iverson at UtopyaCon. MPN: lenore5. Hurry! Limited time offer. Offer valid only while supplies last. ''Lenore in the Breaking Dawn'' In her prettiest ballgown, the ghost of Lenore casts a final look at the raven, before the day breaks and she fades. "Lenore in the Breaking Dawn" In her prettiest ballgown, the ghost of Lenore casts a final look at the raven, before the day breaks and she fades. 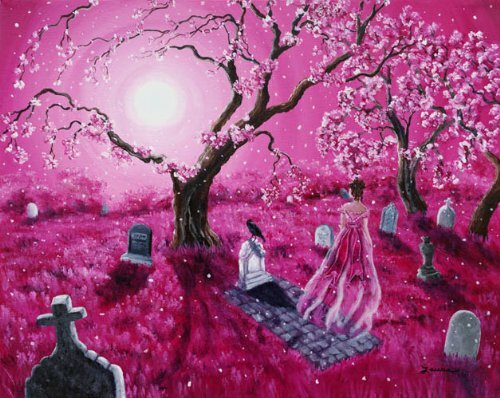 The rising sun illuminates the haunted cemetery, casting light of pink, deepening to magenta. Cherry blossom petals dance among the tombstones. This Gothic fantasy landscape, inspired by the "The Raven" poem by Edgar Allan Poe, is an original acrylic painting on a gallery-wrapped stretched canvas (the 3/4" sides are finished off in black acrylic)--no need to frame. It has been lightly varnished to protect the paint and preserve the lustrous colors. By California Artist Laura Milnor Iverson. If you have any questions about this product by Laura Milnor Iverson, contact us by completing and submitting the form below. If you are looking for a specif part number, please include it with your message.